If I own it and its not MTIO, it must be Gruenwald related. 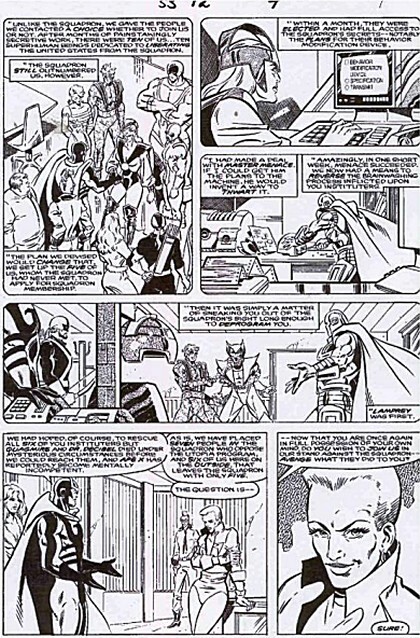 This is from Squadron Supreme issue 12, the final issue of that classic series, written, of course, by Mark Gruenwald. The basic idea is that the Squadron Supreme has taken over the world with the best of intentions. Nighthawk (a former Squadron Supreme member himself) organized the Redeemers (seen here) to stop them. Starting upper right in the first panel and moving clockwise, we have Redstone, Thermite, Black Archer, Mink, Remnant, Pinball, Nighthawk, Inertia, and Haywire, with Moonglow in the center. In subsequent panels we see (besides the aforementioned characters) Master Menace, Lamprey being deprogrammed, and Foxfire. Pretty much a full representation of the Redeemers. This came from the magic of EBay yet again, in March of 2004. As its one of my all-time favorite series, I really wanted to have a page from it, and this is a nice page which sets up the big finale. You have to love that Gruenwald exposition, and you have to feel for Paul Ryan who admirably drew about 25 or so different characters through the course of this issue!